Hyperion Edge: Tron #32, "Tron's Lightcycle"
Tron #35, "Interior, Pursuit Tank"
Tron #34, "The lovely Yori"
Tron #33, "Interior of Clu's Infiltration Tank"
Tron #30, "How can you steal a Recognizer?" Tron #28, "Crom falls in his first game." Tron #24, "Tron in (on?) 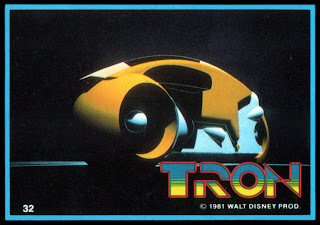 his Lightcycle"
Tron #22, "Derezzing Carrier sequence, Frame 3"
Tron #15, "Vacate entry port, Program!" Tron #14, "The Lightcycle Game Grid"
Tron #11, "Flynn helps Ram to safety."